Frank YangWhat: Toronto Urban Roots Fest, the inaugural edition of a new multi-day festival that’s aiming to do what Bluesfest does for Ottawa and the Jazz Festival does for Montreal – namely bring in a lot of bands that have little to nothing to do with the festival’s titular genre but make great music. And let’s not get pedantic about the “urban” part, hey? How: Single-day tickets for the show range from $50 to $60 in advance, but courtesy of Collective Concerts, I’ve got one pairs of passes for each day of the festival to give away. 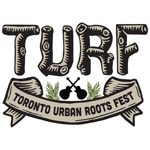 To enter, email me at contests AT chromewaves.net with “I want to TURF” in the subject line and your full name in the body along with which days, in order of preference, you’d like to attend – consult the schedule for who’s playing when. Contest closes at midnight, July 2, 2013.